inspections or the designated inspection group for each vehicle. From this determination, a schedule can be established providing a quota of vehicles for inspection daily that will provide a balanced shop workload. A vehicle/construction equipment service record form similar to that shown in figure 1-4 should be used to record service intervals and service performed. Control, positive direction of shop workloads, is achieved through current information on direct labor available in shop work centers, backlog man-hours by work center, and man-hours assigned. 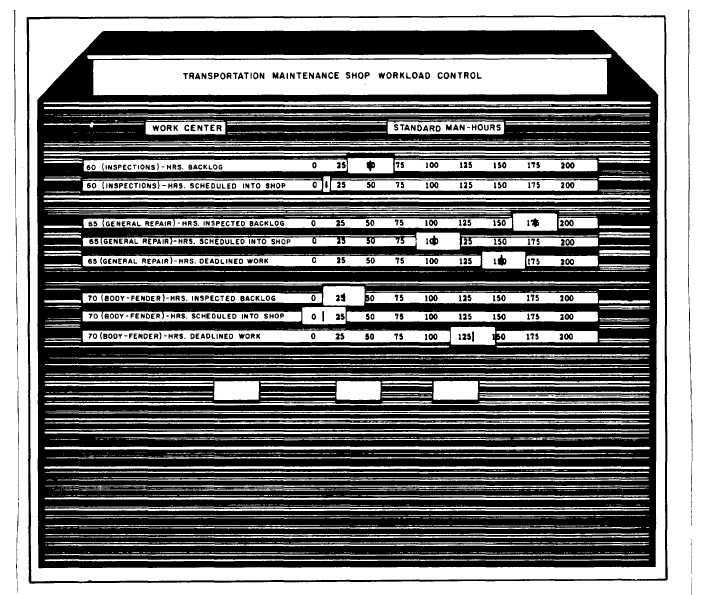 One means is a transportation maintenance shop workload control board (fig. 1-5) to display the workload status of the shop/work centers. The indicator on each line can be moved across the scale to show current standard hours of backlog. This board may also show the available man-hours by shop or subcenter. Progress in obtaining the most availability of safe working equipment within budget restrictions may be charted as required by local commands. Figure 1-5. - Transportation maintenance shop workload control board.